Known for their interplay with historic and modern elements as well as always inventive high and low interpretations, Roman and Williams took the spirited history of the Pearl Brewery - whose signature beer produced a rich foam of pearl-like bubbles – as their place of departure. The hotel’s name itself is an homage to the epic determination of Otto Koehler’s widow Emma, who built the business into Texas’ top brewery in the early 1900’s, and who made it an institution by enduring through the Great Depression. With such a strong heritage and narrative the designers seized this opportunity to pay tribute to the grit, cleverness and purpose of western pioneers – and the satisfaction of a cool glass of beer at a shared table. Stirred also by the challenge of creating old-world comfort within the historical and industrial context of this existing factory building, Roman and Williams incorporated a deep reading of the location –tracing the intersection of historical trade routes that mingled Latin influences with European culture, and investigating the original materials that still rested on the site, obscured beneath layers of dust. What resulted is an eclectic and curated juxtaposition of a whole spectrum of styles - old, new, industrial and refined - evoking a soothing domestic yet exotic and romantic feeling throughout the hotel. The fascination of Hotel Emma begins outside, where a colonnade of industrial beams leads visitors into this new territory. Upon entering guests are welcomed into a richly textured lobby, where Roman and Williams responded to the monumental scale of the hotel by embracing and reclaiming large industrial fixtures like the fly wheel of a generator, with its magnetically powerful allure. They also stabilized the existing chipped plaster walls, revealing layers and elements of the masonry beneath, and carpeted the floor with patterned encaustic concrete tiles, rescued from the past by a keen-eyed glimpse of the building’s original flooring. Sinker Cypress wood paneling brackets the far ends of the space to add a layer of warmth to the otherwise vast space. Vintage furniture and lavish carpets sourced from around the globe are lit by bespoke brass, bronze and blown-glass chandeliers that reference a bygone grandeur, punctuating the space from the preserved wood-slatted ceiling above. Tapping the rich multi-cultural influences of the region, guests will have the opportunity to experience a broad and beguiling range of dining options from the renowned chefs at Emma. In the Sternewirth Bar and Clubroom, located in the great hall with its soaring 25-foot-high vaulted ceilings, a large bar sits on a base inset with lively patterned concrete and is flanked by repurposed cast-iron tanks reimagined as intimate social spaces, with curved banquette seating inside. A steel mezzanine floats above the bar, bearing a display of glowing amber beer bottles that illuminate the building’s brewery past. The mezzanine also houses a collection of books, which can be accessed by the thoughtful intervention of a steel stair created for the site. 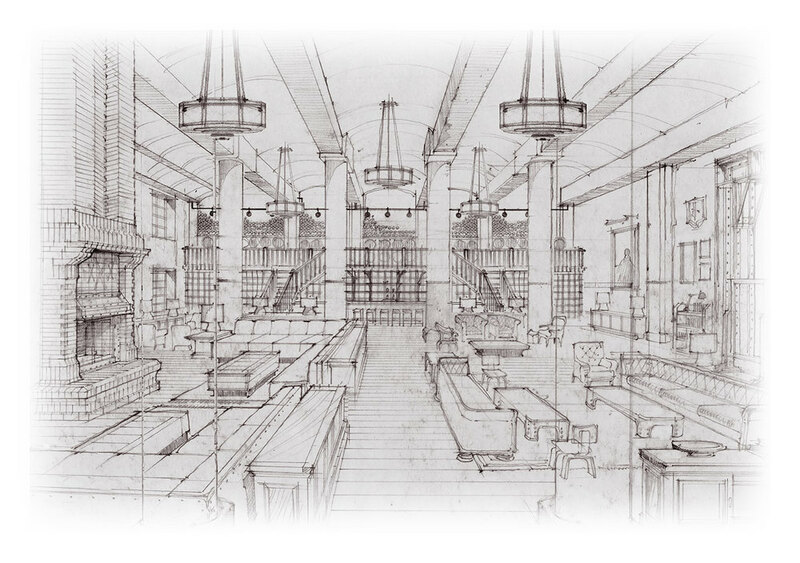 To create a provocative centerpiece in keeping with the massive scale of the space, Roman and Williams devised an immense fireplace whose light ripples over the room and complements the grand chandelier sculpted from an amazing hybrid of modern yet traditional metal components previously employed in the Pearl’s bottling room. The artfully composed seating beneath this chandelier encourages a variety of relaxed social tableaux - guests can cozy up on buffalo leather-covered sectional sofas, drape themselves over Moroccan leather ottomans or settle into muscular arms of oversized, vintage, Kilim-upholstered armchairs that reflect this unique American crossroads. At Supper, with its menu of fresh seasonal greenmarket cuisine that flirts flavorfully with South Texas’ many cultural inspirations, Roman and Williams’ glossed white interiors set a light-filled stage for an unpretentious farm table meal. Roomy booths create a welcoming ambiance and pendant lights bathe the dining room in a warm, happy glow. A beautifully-designed Roman and Williams exhibition kitchen, with classic tile work and dimensions, will complete the rich array of the hotel’s culinary offerings. Students from the neighboring Culinary Institute of America and guest chefs will immerse visitors in the sights and smells, the artistry and technique of a beautifully-prepared meal – extending hospitality reminiscent of a visit in a beloved relative’s kitchen. Larder, a locally-sourced gourmet market will invite guests who want to improvise their own luxurious al fresco dining experience – perhaps taking their provisions to the magical all-season loggia Roman and Williams have created off of the hotel, to relish their delights beneath the overgrown bougainvillea, with the sound of the river below. In the guestrooms, Roman and Williams playfully walked the delicate line of high and low design in order to create a bedroom for a pair of mythical world-travelers. The monumental glazed black bed was inspired by furniture archetypes of the past, such as the artistry of the Herter Brothers; and an elegant settee was juxtaposed with more humble hand-crafted pieces featuring natural saddle hide leather framed by carved white oak. Guestrooms in the Brewhouse tower lay bare the existing brick and plaster walls and proudly preserve historical elements and fixtures native to each room. 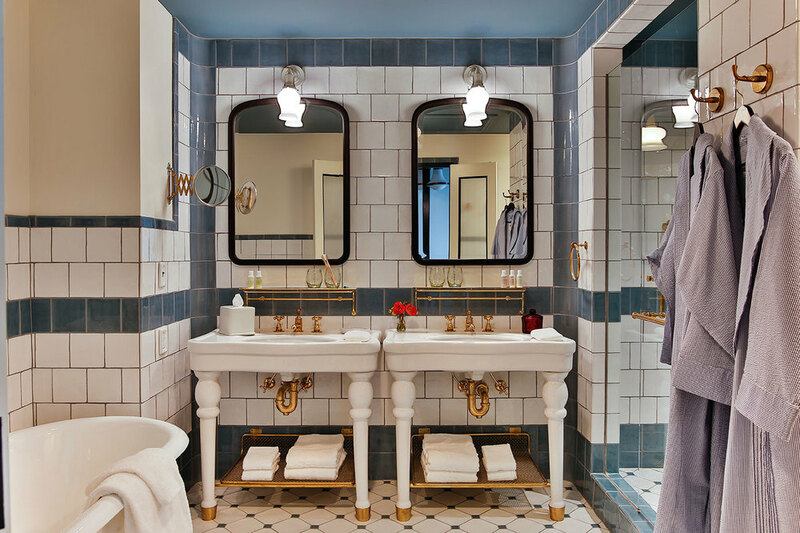 Guest bathrooms feature walls custom-tiled in watery blues and cream, incredibly glazed, but with a rustic surface developed by Roman and Williams. The glorious simplicity of porcelain vanities and brass plumbing fixtures underscores the discreet charm of the commode. By thoughtfully translating the authenticity of the Pearl and its story in every room and in every detail of the Hotel Emma – from the most exalted chandelier to the smallest rivet - Roman and Williams have re-activated this building raised by pioneer effort , lifting it out of time and setting the stage for the adventures of epochs to come.